Take a private 5-hour boat tour of the Cinque Terre coastline with the flexibility to stop for swimming and a picnic lunch. Depart from Monterosso on a traditional boat with a small cabin and shaded teakwood deck. Your captain shares secret spots to swim and snorkel, and provides snacks and lunch on board. Make your own way to the Monterosso pier in time for your departure at 11am. Board the picturesque traditional boat, sip a welcome drink, and have time for a swim in Monterosso Bay. 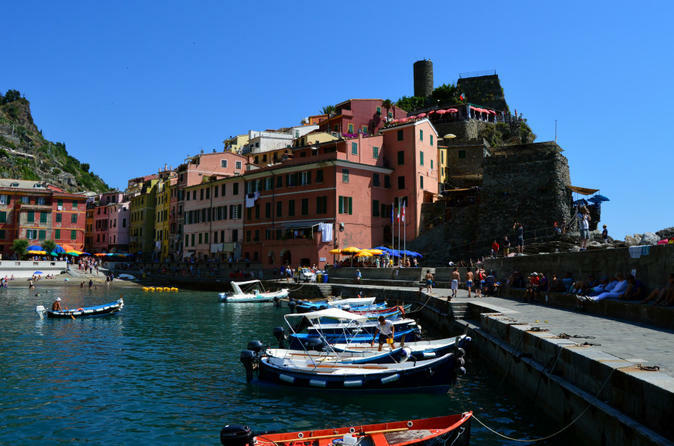 Next, head to Vernazza where you can take a short walk in the village (conditions permitting). Continue along the rocky coast to Riomaggiore where you have a homemade lunch on board the boat. Lunch consists of fresh bruschetta or rice salad, focaccia with pesto, salami and cheese, fresh fruit, coffee, and the limoncino made in the Cinque Terre. Your private tour allows you flexibility as you relax on the boat, swim and snorkel. Head back to Monterosso around 4pm to end your tour with drop-off at the pier after five hours.